At this point, there really isn't anyone to offer them a serious challenge. At age 32, Rafael Nadal has retooled his strokes and tactics with the goal of playing more efficient tennis on hard courts, the surface that has exacted the harshest toll on his knees since he turned pro in 2001. Heading into the Australian Open men’s final, that makeover worked to perfection. He steamrolled through six opponents without dropping a set. Nadal’s first serve was devilishly placed and precise. His forehands were blasted down the line on a rope – a change-up from his go-to, arcing cross-court shot. But Novak Djokovic had an answer for each of Nadal’s new strokes and tactics Sunday. Djokovic served better and returned brilliantly, breaking Nadal five times in a 6-3, 6-2, 6-3 victory – more times than he had been broken all tournament. Djokovic defended better and attacked more effectively, knocking the muscular Nadal on his heels with quick, penetrating groundstrokes. Djokovic rarely placed a ball anywhere but the precise spot he intended, committing just nine errors. And a matchup that was predicted to be memorable was over in the blink of an eye, with Djokovic needing just two hours, 27 minutes to utterly dismantle Nadal. In becoming the first man to win the Australian Open seven times, Djokovic, 31, extended his list of major titles to 15, putting him within two of Nadal’s 17 and within five of Roger Federer’s record 20. But as wide as the gap was between Djokovic and Nadal on Sunday, the gap between the two of them and the highly touted next generation of men’s tennis players is greater. Young phenoms Alexander Zverev, 21; Stefanos Tsitsipas, 20; Denis Shapovalov, 19; and Frances Tiafoe, 21, are all now ranked in the top 30 and showing tremendous promise and building a next-generation fan base the sport sorely needs. But their games aren’t nearly as complete, their tactics not as savvy, and their Grand Slam intensity isn’t as bloodthirsty as that of Djokovic and Nadal, who demonstrated anew how exceptional they are. The women’s side, by contrast, signaled that a new era has arrived, with 21-year-old Naomi Osaka backing up her unexpected triumph at the U.S. Open last September to earn a second consecutive major and, with it, the No. 1 ranking. Osaka showed fierce tenacity in turning back two-time Wimbledon champion Petra Kvitova in a three-set final that lasted 23 minutes longer than Sunday’s men’s final. She also became the first woman other than Serena Williams to win back-to-back Grand Slams since Kim Clijsters in 2010-11. That’s not to say that Williams, 37, won’t win more majors to put her Open era-record 23 even further out of reach. But the Australian Open suggested that the pecking order atop women’s tennis is dynamically in flux, with young players such as Amanda Anisimova, 17, and Aryna Sabalenka, 21, flashing impressive power and grit, while familiar faces Caroline Wozniacki, Angelique Kerber and Simona Halep fell short of expectations. The men’s game, for now, is a crowd of two after revolving around four players for the last 10 to 15 years: Federer, Nadal, Djokovic and Andy Murray. Federer, at 37, remains a joy to behold but hasn’t advanced past the quarterfinals of a Grand Slam since vanquishing Marin Cilic in five sets in Australia this time a year ago to claim his 20th major. And Murray, 31, announced on the eve of the Australian Open that this season will be his last because of chronic, debilitating hip pain that a 2018 surgery failed to alleviate. That leaves Djokovic and Nadal firmly atop the sport. At 31 and 32, they are proving better with age. They are wiser about managing the wear-and-tear on their bodies. They are greedier about each opportunity to embellish their legacy. And though ranked No. 1 and 2, respectively, and occupying the perch that every top-30 player covets, they are continuing to adapt, determined to refine and adjust their skills to fend off the next opponent and all that time inexorably takes away. With his clinical perfection in the men’s final, Djokovic cemented his status as the sport’s greatest on hard courts. Nadal, with 11 French Open championships, is firmly ensconced as the King of Clay. Yet both are still chasing Federer’s record 20 majors and a least a stake in the debate over being greatest of all. 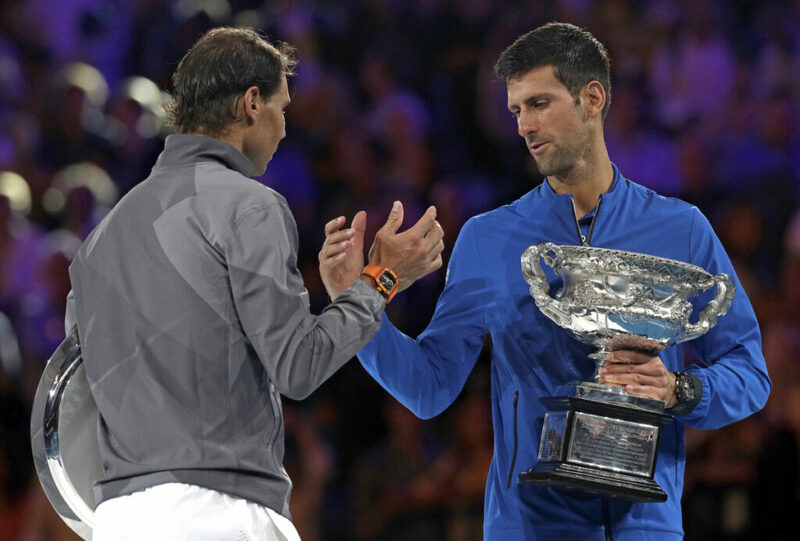 In his on-court remarks during Sunday’s trophy presentation, Djokovic paid tribute to that quality in Nadal, who he regards as his greatest rival and the player most responsible for pushing him to be even better. And Nadal, who was never a threat in the match, unable to find a single solution for Djokovic among his talents, vowed to keep working after the most lopsided defeat in a Grand Slam final of his career.